Upright, Emerald plumes make Foxtail Fern a gorgeous accent plant for container groupings or staging among tropical. 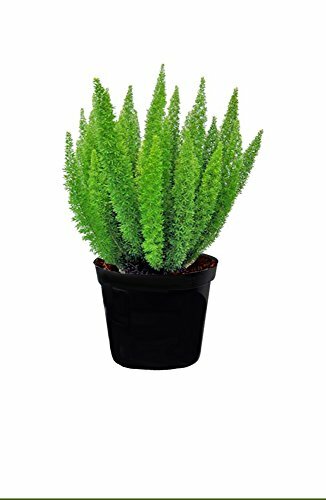 This beautiful house plant is easy to grow & some say more decorative than its close relative, the asparagus fern. Stems are densely covered with 1 in (2.5 cm) needle-like leaflets give this plant a delicate, feathery appearance. But don't let its fragile appearance fool you. In its native, warm temperature forests of Africa, this plant is an aggressive grower. Foxtail Fern has upright, emerald plumes that appear delicate, feathery and its White flowers and Crimson berries add visual interest. Foxtail Ferns are tough and hardy specimens, flourishing with limited Care. Foxtail Fern plants are drought resistant once established. Foxtail Fern is a gorgeous accent plant for container groupings, staging among tropical, or as a single specimen planting. Does not ship to CA or az.